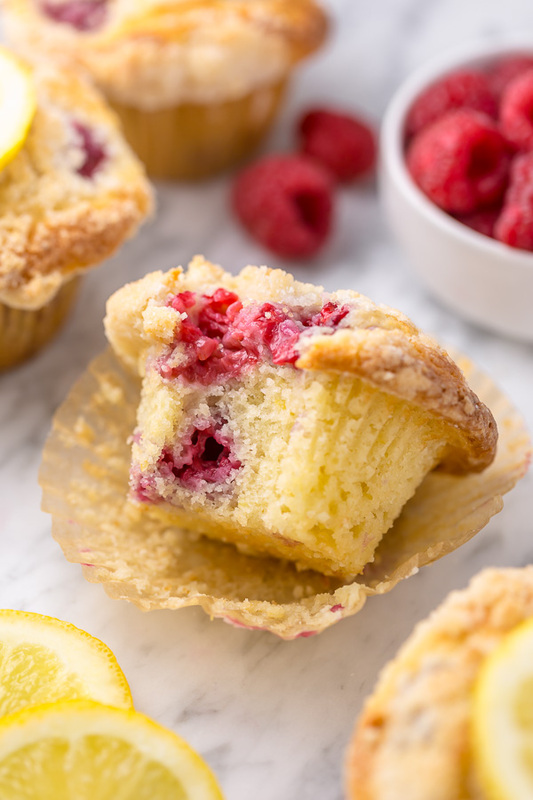 Moist and sunshiny sweet, these Lemon Raspberry Crumb Muffins are so good with a cup of coffee! Loaded with fresh raspberries and bursting with real lemon flavor, these are a must try for any lemon and raspberry lover! dry ingredients: flour, baking powder, and salt! these ingredients bind the batter and help the muffins rise. lemon juice, lemon zest, and lemon extract: this trio of lemon flavors adds a bright punch of lemon flavor to the recipe! you may omit the lemon extract, but the lemon flavor will be more subtle. sour cream: makes the muffins moist and adds a subtle tangy flavor. bring your sour cream to room temperature! cold batters don’t bond. vanilla extract: brightens the lemon and raspberry flavors. butter: adds flavor and moisture. granulated sugar: our sweetener for this recipe. eggs: create structure and stability. be sure your eggs are at room temperature! raspberries: fresh or frozen will work! if using frozen, do not thaw first. And be sure to fold them into the batter GENTLY! As raspberries are delicate in nature and break easily. There are 3 steps to making these muffins! First, you’ll make the crumb topping. To do this, you’ll simply combine the flour and sugar, then cut in the butter until the mixture resembles a coarse meal. Pop the crumb topping into the fridge while you make your muffins! Next you’ll need to assemble the batter. This is super easy because no electric mixer is required! You’ll simple combine the flour, baking powder, and salt in one bowl. Then combine sugar, lemon juice, lemon zest, lemon extract, eggs, butter, and sour cream in another bowl. Then combine the wet and dry ingredients together. Finally, you’ll gently fold in the raspberries. Final step, divide the batter evenly among the muffin molds. Top with crumbs. And bake for about 20 minutes!!! If you’re using the glaze, you can whip this up while your muffins bake. This recipe yields exactly 1 dozen muffins! Be sure to allow the muffins to cool in the pan for at least 5 minutes before removing them. 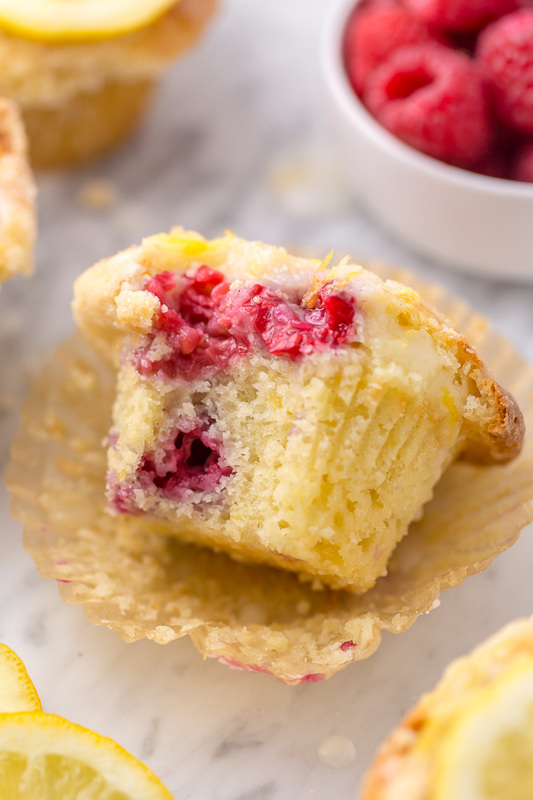 In my opinion, these lemon and raspberry muffins are best eaten warm, the day they’re made, but they’ll “keep” in an airtight container for 48 hours. 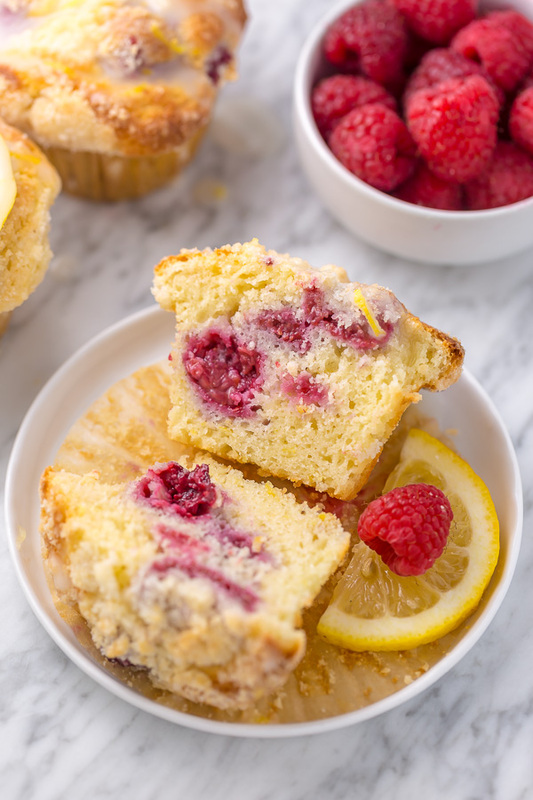 Can you Freeze Lemon Raspberry Muffins? Totally! After cooling, simply place the muffins in a freezer-safe Ziplock bag and pop them in the freezer for up to two months. Thaw on the counter or briefly warm them up in the microwave before serving. We love serving these muffins for breakfast or brunch because they’re SO good with a cup of coffee or tea! But they’re equally great as an after-school (or after work!) snack. 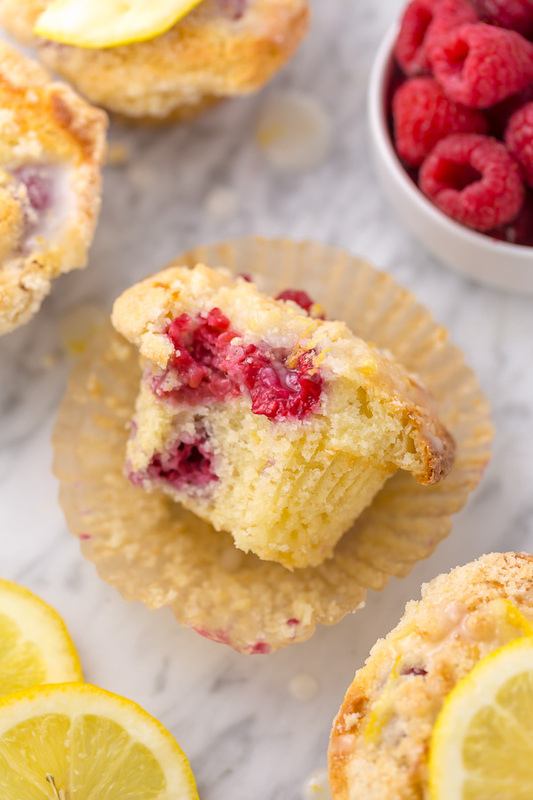 So if you’re looking for a new muffin recipe to try this Spring, look no further than these Lemon Raspberry beauties! 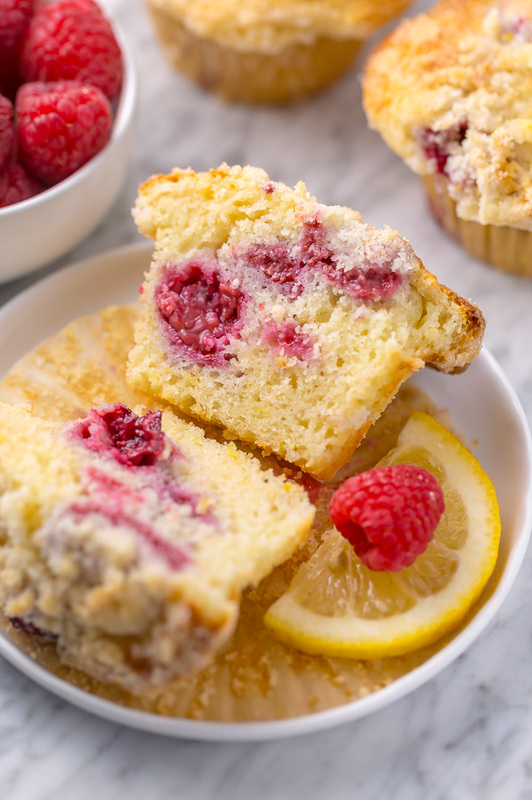 IF YOU TRY THIS RECIPE FOR LEMON RASPBERRY CRUMB MUFFINS, LET ME KNOW! LEAVE A COMMENT BELOW AND DON’T FORGET TO SNAP A PIC AND TAG IT #BAKERBYNATURE ON INSTAGRAM! SEEING YOUR KITCHEN CREATIONS MAKES OUR DAY. In a medium bowl combine the flour and sugar. Add in the cubed butter and mix, with a pastry blender or two forks, until the mixture resembles a coarse meal. Place in the fridge until needed. In a separate large bowl, whisk together the butter, sugar, eggs, vanilla extract, sour cream, lemon juice, zest, and extract (if using), mixing until ingredients are fully incorporated. Add the dry mixture of ingredients to the wet mixture of ingredients and, using a rubber spatula, gently fold until just combined. Fold in the raspberries until combined. Sprinkle each filled muffin tin mold with a teaspoon or two of the crumb topping. Bake for 22 minutes, or until the tops are puffed up and lightly golden brown, and a toothpick inserted in the middle comes out clean, or with a just a few moist crumbs attached. Cool muffins at least 5 minutes in the pan before transferring to a cooling rack. In a small bowl combine the confectioners' sugar, lemon juice, and zest, whisk until smooth, adding more juice as needed to reach desired consistency. Drizzle over the muffins right before serving. Hi, they are great. Thank yoh for the recipe. Just one thing – I used frozen and the inside was still wet after baking., so I prolonged the baking. What to do? 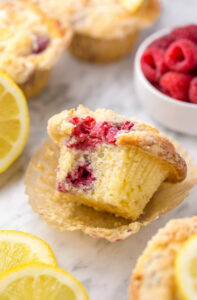 I can’t remember pairing lemon and raspberry before, I definite;y think raspberry needs a pairing since they’re not my favorite fruit when left by themselves, really like the ingredient “walk-through” and tips, since baking is not my best art. appreciate all!